Note: 2014/06/30 This blog was replaced as part of a larger site rebuild in mid 2013. 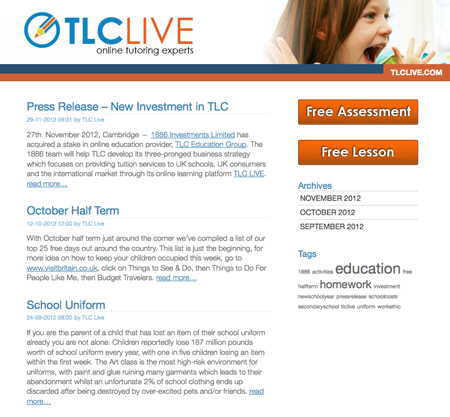 TLC are online tutors based in the UK. We recently added a simple blog to their site to allow anyone in the company to add content to the site. They can use it to trumpet company announcements and extol the virtues of their learning platform. We added a few plugins in that the client requested from an earlier system they had used. Other than that its pretty plain vanilla WordPress with some adaptions. We wrote a custom excerpts function so we could finish the excerpt at the end of the first paragraph. The client also wanted the excerpts to keep their formatting and links which are often removed by default. Also wrote a couple of widgets to emulate the behaviour of some links on their main site. They also have a more useful than standard 404 page which lists recent articles if you mistype an address. You can see the site at www.tlclive.com/blog.